A series of music examples recorded by Peter Muir and available for free download or to hear as streaming audio. 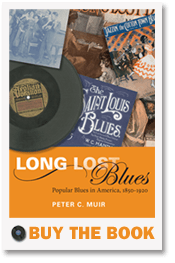 A chronological listing that contains all known titular blues compositions published as sheet music in America from 1912 to the end of 1920. A list of all known recordings of titular made in America before January 1, 1921, and including the few recordings of blues that American bands made outside America in the same period. A list of piano roll recordings of titular blues copyrighted before January 1, 1921, including all known roll recordings of a composition, whether or not they were made by the cut-off date.